The Medallion Front is a contrasting etched / high luster polished Stainless Steel Cross. The Crossed Roads (curved) Cross is a one of a kind unique custom design that is only available at Saint Michaels Jewelry! The Crossed Roads is meant to represent that moment in your life when you made the decision to put God first and you were forever transformed. 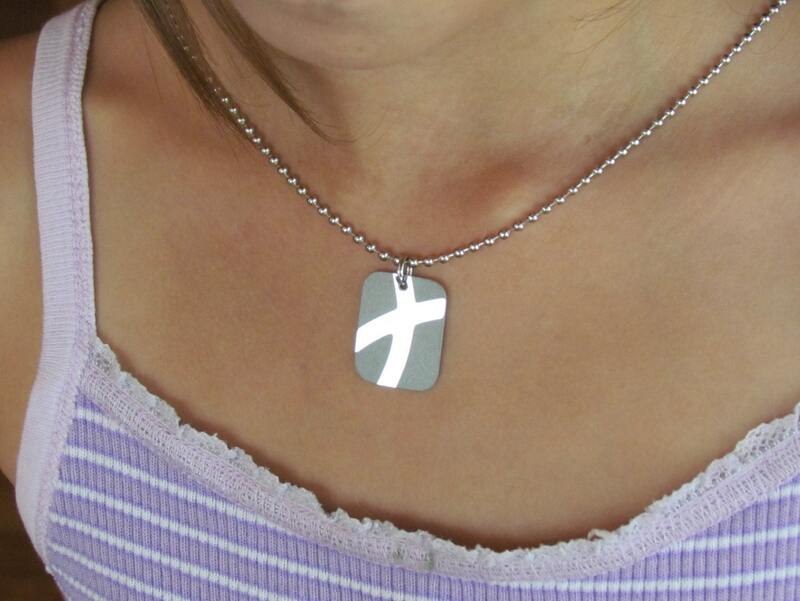 The All Stainless Steel Crossed Roads design is the Ultimate in hand made Crosses. Each Cross is hand etched front and back, hand cut from a Stainless Steel sheet, then drilled, chamfered, wheel polished, and cleaned. 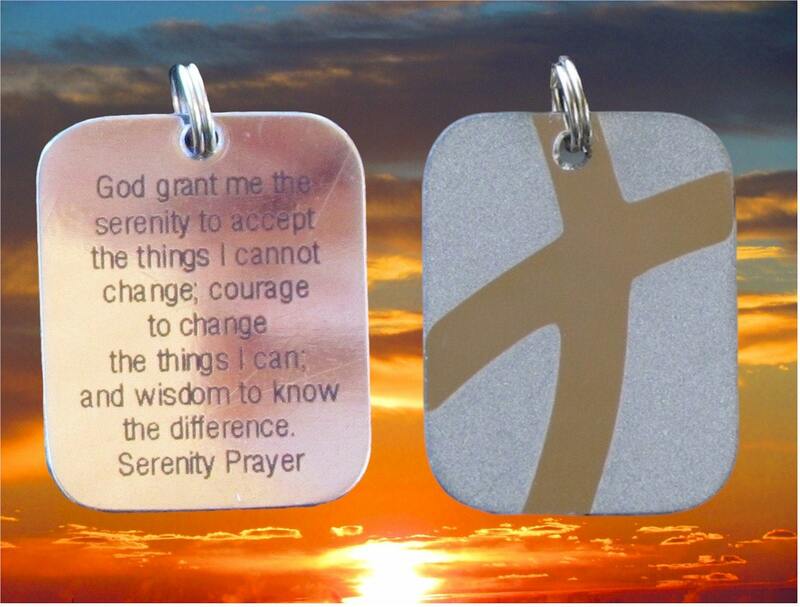 o The Back is Laser etched with high durability Black compound with the verse: 'God grant me the serenity to accept the things I cannot change; courage to change the things I can; and wisdom to know the difference. Serenity Prayer'. o The Front is patterned then Sandblasted with graphite dust. Each Cross is Handmade to Order and measures 3/4" wide x 1" tall. STANDARD - Each Cross is Silver in Color and comes with a complementary steel snap ring and a 2.4mm 24” ball chain. The ball chain can be easily cut to size with a scissors when you receive it. 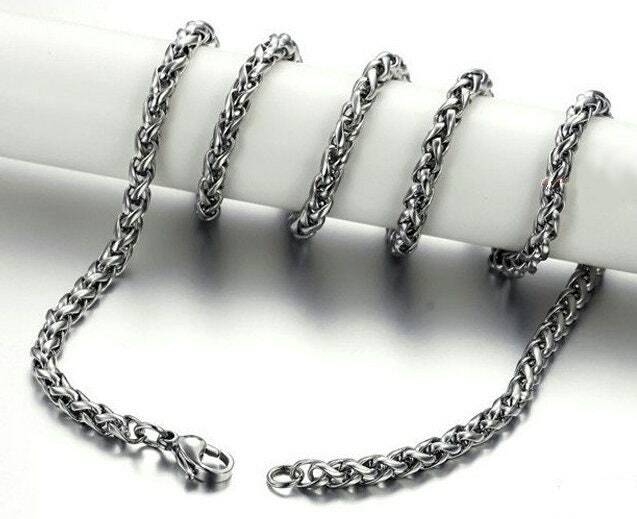 BONUS - Add our exclusive Heavy all Stainless Steel 4.4mm wide x 20” (see photos) braided snake chain with positive locking lobster clasp for only $6.00 more! 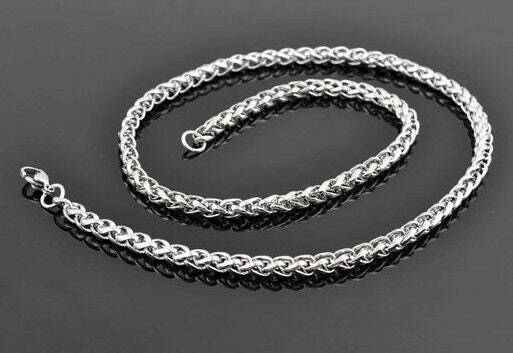 This chain has a great feel. The braid design gives it a heavy, silky feel. And, the design will never pull the hair on your neck! Each Pendant is Hand Cut, hand hammered and polished to a High Luster to shimmer and really reflect the light. And, Stainless Steel will retain it's luster for many years to come!